Seven grams (1/4 oz) of Tanacetum parthenium, aka Feverfew from Juicy Herbs. This herb has been used to treat migraines and reduce fevers. Juicy Herbs includes a free pack of Juicy Jay’s flavored rolling papers in each pouch so you're ready to smoke! Having gotten used to Marshmallow and Spearmint, which is very well ground, I was disappointed to find this very course and not easy to use. 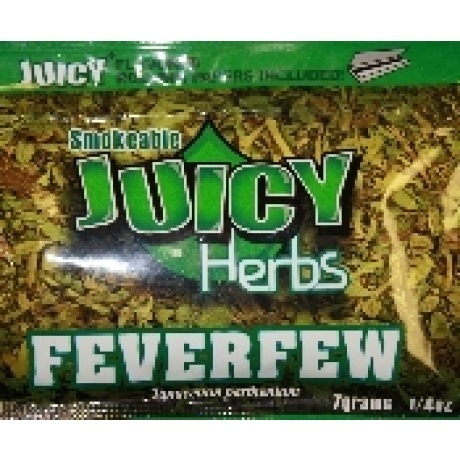 Juicy Herbs "Fever Few" lit easily and held an ember well. It has a smooth flavor, but is not sweet. The only downside I found was that it needed to be ground better and should have been more uniform. There were to many large 'sticks' and pieces, which made it harder to roll, and even harder to compact correctly. This left to much air space and allowed it to burn hotter and quicker than what I would have liked. With a little more grinding, and more uniform sifting, this would make a good relaxing smoke.